A few days ago, I heard of a 90 year old woman who refused an IV line because the doctor said she would have to go into a hospital if she had it put in. She wanted to spend her last days at home. I know, and many of you know, that this is a non-issue. There are ways for people who need I.V. treatments to have them at their homes. A few days ago, I heard that a local homeless advocate wanted to set up a campsite, so those who are homeless would have another choice than sleeping in doorways or sidewalks. But the city didn’t think it would work. The L.A. County jail continues to be the largest institution for those with emotional disabilities in the nation. The county where I live, one of the richest in the U.S., has no in-patient treatment for people with emotional disabilities. Twenty years after the Americans with Disabilities Act (ADA) was passed, problems like this, problems with common sense solutions, continue to fester. The ADA is not a failure. The ADA brought us accessible buildings, bathrooms, sidewalks, buses. It gave many children and young adults the opportunity for education, travel and social lives. Despite the business whining that ADA access is too burdensome for their bottom line, the ADA brought people with canes, sign language, protective masks and wheelchairs into our public spaces. I celebrate this anniversary with a re-dedication. Freedom for people with disabilities is not about bringing more workers into a capitalist system. Freedom is about dignity and membership in the human community. I dedicate myself to the fight for this freedom. Today, people who could live in the community are forced into for-profit institutions because society believes their physical condition is too troublesome to care for individually. People with mental and emotional disabilities are offered few treatment options and, if they end up on the street, their final destination is often jail. We have no choice. We must stand with those who are not yet among the free. 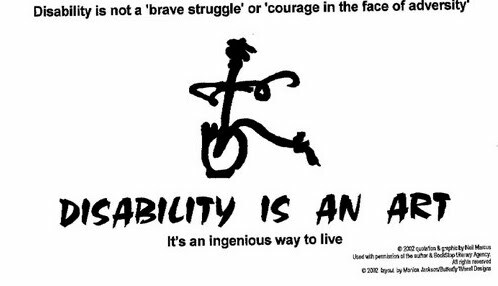 This entry was posted in Arts, Politics and tagged 20th Anniversary of the ADA, ADAPT, Disability is Art, Neil Marcus. Bookmark the permalink.